Public Health Sector, Govt of Sindh invites applications for the following posts. Asstt.Admin. Officer, Asstt. 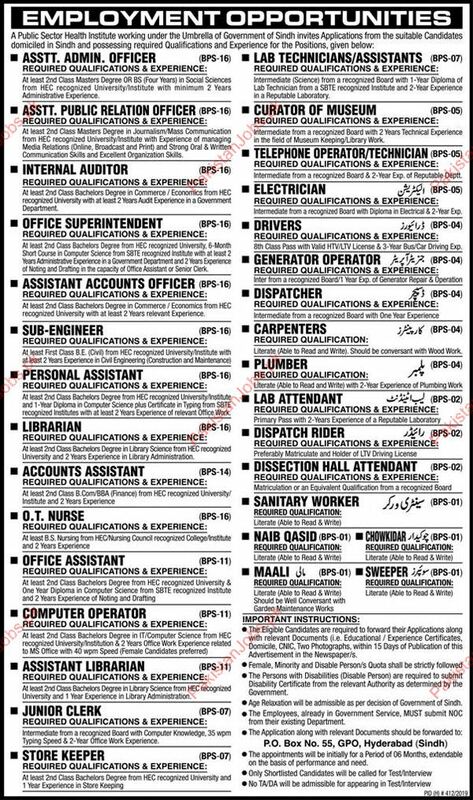 Public Relation Officer, Internal Auditor, Office Superintendent, Assistant Accounts Officer, Sub Engineer, Personal Assistant, Librarian, Accounts Assistant, O.T Nurse, Office Assistant, Computer Operator, Assistant Librarian, Junior Clerk, Store Keeper, Lab Assistant, Curator Of Museum, Telephone Operator, Electrician, Driver, Dispatcher, Carpenter, Plumber, Lab Attendant, Dispatch Rider, Dissection Hall Attendant, Sanitary Worker, Naib Qasid, Maali, Chowkidar, Sweeper. Google it, apply for a job now.